This is a bee larvae cake, a dish from the ever-popular Sovanna restaurant (No 2C St 21, just south of Sihanouk Blvd). 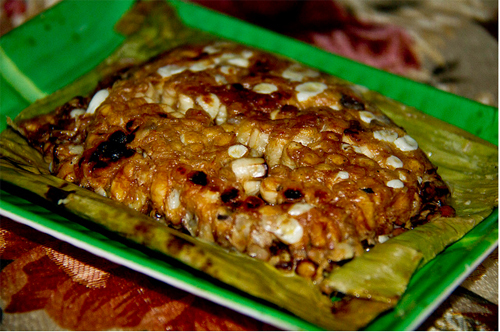 It’s steamed with spices in banana leaves, and picked at like a snack. We had a friend visiting Cambodia who wanted to sample Khmer cuisine, and what better way to do that than to get a big group together so you can toss something like this into the meal mix? ;-) It has a gummy sort of texture, and the larvae pop like a pocket when you bite down on them. It’s got a nutty taste, a little sweet, with a hint of honey. No one disliked it, though it won’t be something we will normally order. Photo from Keith Kelly.